Play Rainbow Riches Slot Online with 500 Free Spins! Rainbow Riches (The Original) is a WORLD-FAMOUS Slot Game by Barcrest. It has a 95% RTP and bonus features including Road to Riches, the Wishing Well and Pots of Gold. This game was originally launched in 2005, with an updated version in recent years for Mobile play. Rainbow Riches slot game is one of the very best known slots in the UK, it combines the classic magical luck of the Irish with incredibly exciting bonus features such as the Road to Riches, the Wishing Well and Pots of Gold. Rainbow Riches was created by Barcrest and originally released in 2005 with many recent releases to leverage the phenomenal success of this slot game such as Rainbow Riches Pick N Mix (released in 2016), Rainbow Riches Reels of Gold (2016) and the most recent Rainbow Riches Drops of Gold released in 2018. Rainbow Riches Free Play is a visually stunning game, the arc of a magical rainbow stretches across the backdrop of Rainbow Riches slot, with a purple sky and lush green field. The reels themselves are framed in a beautiful Celtic gold pattern which is presented by a sprinkling of magic dust when the game loads. So what makes Rainbow Riches special? It mainly comes down to the unique and innovative bonus rounds, the Road to Riches, Wishing Well and Pot of Gold features. In addition to the bonus rounds, there are the usual wild and scatter symbols. As with all classic slots, this game has the lower value symbols which are standard playing cards A, K, Q, J, and 10. Rainbow Riches online slots visually impress with colourful cartoon-style illustrations that particularly stand out against the dark background and whilst there is no background music, the chimes and jingles upon wins and spins enhance the cheerful quality of gameplay. You can have a good Ol’ craic at Rose Slots in playing Rainbow Riches and trying to find your way to the end of the rainbow where you can find many chances to win real money on the journey and perhaps a shiny pot of gold. Rainbow Riches is a straightforward slot game with 5 reels, 3 rows, and 20 paylines, you may feel as if you’ve grabbed a handful of lucky 4 leaf clovers. The Wild gold coin replaces all other symbols, except the 3 different Scatters and if 5 Wilds appear on the reels, you’ll be awarded a 25x multiplier on your total bet. This game has a flexible betting range from 1p to £400. If you have to practice your Irish dancing, simply set the AutoPlay for uninterrupted spins. You can even play Rainbow Riches online while hiking through the green meadows as it is fully compatible with mobile devices including Android and IOS / Apple as well as on tablet and desktop. With 3 different types of exciting bonuses and versatile betting, the theoretical RTP of this game is 95%. Many players ask if there are Rainbow Riches cheats, and unfortunately, the answer is No, this game has and always will be completely fair for all players. The 3 different Bonuses in Rainbow Riches online are triggered when at least 3 of the symbol appear on the reels. Wishing Well bonus: In Wishing Well bonus feature you choose a Wishing Well to receive a random multiplier award. If the luck of the Irish has rubbed off, you could be winning up to 500x your total wager. Pots of Gold bonus: This bonus round also awards up to a 500x multiplier and involves involve pots of gold, silver, and bronze moving around the reels. When an arrow points to one, you will be awarded the corresponding reward. Roads to Riches bonus: This lets you spin from 1 to 6 steps on a cash path to collect greater winnings up to 200x your total bet. While Rainbow Riches slot game may appear simplistic but it is far from it, the maximum possible jackpot is an exciting 25,000 coins. Online casino developer, Barcrest, are the creators of the innovative Rainbow Riches slot. Barcrest, as a partner of the gaming giant, Scientific Games, has built a positive reputation over 50 years for developing titles with impressive visuals, engaging gameplay, and generous bonus features. Here at Rose Slots players can enjoy the sequel ‘Rainbow Riches Pick N Mix, and you can also play SG slots such as ‘Legends of the Pharaohs’ and ‘Monopoly Bring The House Down’. If you enjoyed Rainbow Riches slot, you should also play the similar Irish-themed ‘Lucky Leprechaun online slots’. 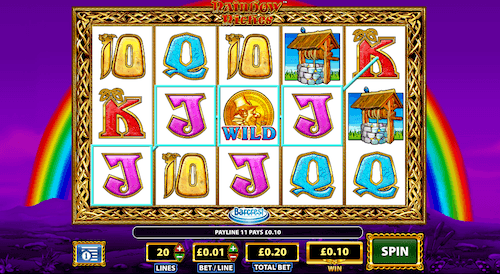 Rainbow Riches Slot Game - The original classic by Barcrest launched in 2005. With the classic features of Road to Riches, Wishing Well and Pots of Gold Bonus Rounds. 20 Paylines, 5 Reels. 95% RTP. Rainbow Riches Pick N Mix - This reinvention of the Rainbow Riches UK slot game allows players to choose your own 3 bonus rounds to be active in the game. Choose one to be most active or three for a bit more variety. RTP depends on selected features - 94-96% RTP. Rainbow Riches Reels of Gold - A much more advanced version of Rainbow Riches with an additional set of reels to create many more pay line combinations. Colossal Reel, Big Bet Feature make this game truly unique. 94-96% RTP. Rainbow Riches Drops of Gold - Launched in 2018, Drops of Gold features a new "wild stream" which drops a new set of wild symbols into the reels when it is triggered by the Drops of Gold symbol on the main reels. The latest game to join the family is Rainbow Riches Slingo and Rainbow Riches Bingo.